But they are really BANANA PANCAKES! Didn’t see THAT one coming, did you! Did you!!?? Did…. never mind. Anyway, they were delicious. We even had a special tiny pancake left over for the dog, who also approved. Here is our recipe, adapted from a basic one we found on the web. Beat ingredients until well blended. 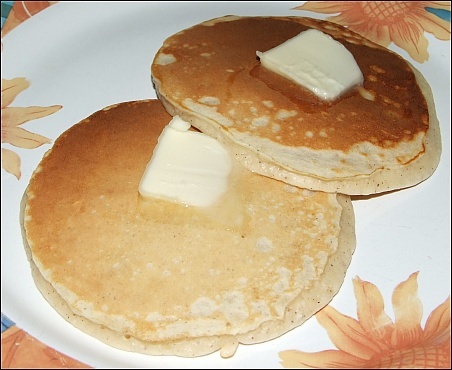 For thinner pancakes add more milk, a little at a time, as needed. Pour by 1/4 cupfuls onto hot griddle – we recommend greasing the griddle beforehand. Cook until edges are dry. Then flip and cook until golden. Yields 12-13 pancakes, depending on size, etc.